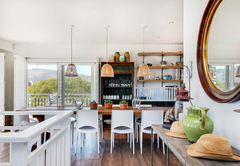 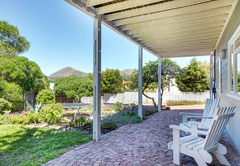 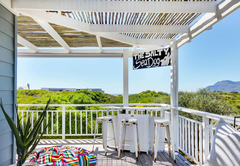 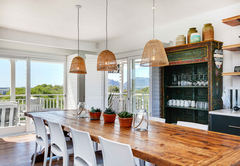 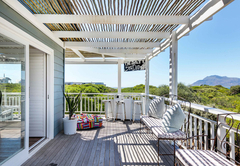 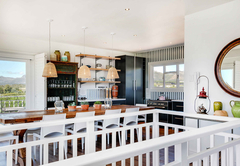 Slip Slops is a property providing self catering in Kommetjie for up to 6 guests visiting the Atlantic Seaboard region. 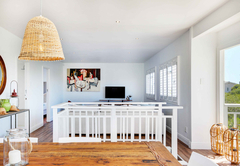 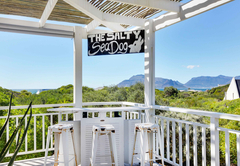 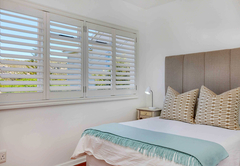 Slip Slops Holiday House is a newly renovated, immaculate beach house situated just a short walk from Long Beach with lovely views over the Milkwood trees towards Chapman’s Peak. 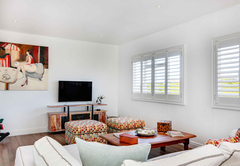 The ideal home for two families, everything has been carefully thought-out in this light, bright and very tastefully decorated property. 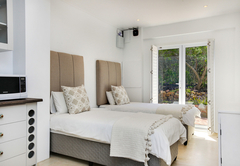 Slip Slops Holiday House can sleep six guests in four bedrooms. 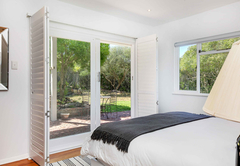 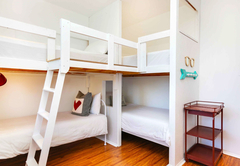 The first bedroom is furnished with double bed and has a bathroom with a shower, the main bedroom has a King-size bed and makes use of a shared bathroom and the third bedroom is furnished with bunk beds, especially for children. 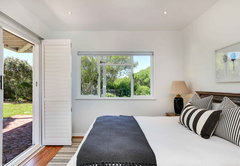 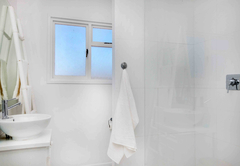 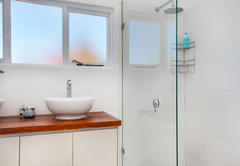 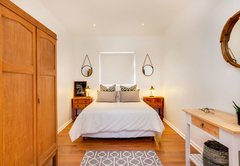 There is also a flatlet which is furnished with a Queen-size bed and has an en-suite bathroom with a shower. 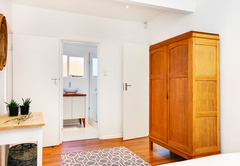 There is also a kitchenette and lounge with TV. 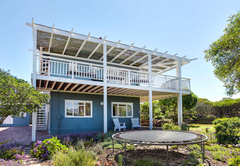 The living area is upstairs and opens to a wonderful wrap-around deck with outside furniture, sun blinds and a little bar area. 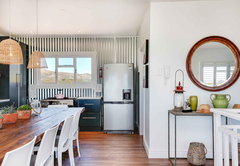 The kitchen is well equipped for self-catering and includes a with a dishwasher, washing machine, tumble dryer and microwave. 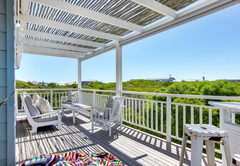 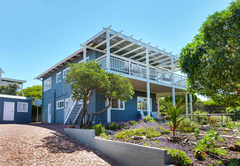 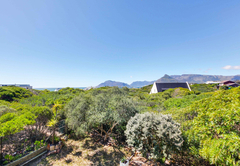 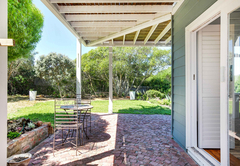 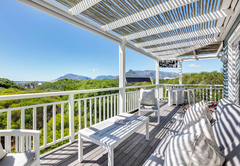 A newly renovated, immaculate beach house just a short walk to Long Beach with lovely views over the Milkwood trees towards Chapmans Peak. 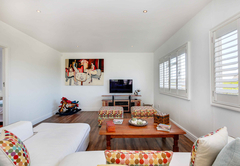 Lovely for 2 families (6 adults and 4 children over 10). 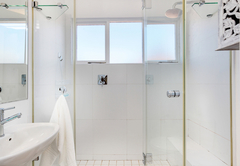 Response timeSlip Slops typically responds to requests in 5-10 minutes. 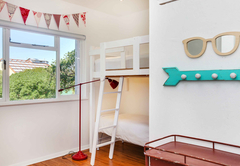 Child policyThe house sleeps six adults and is not suitable for children.